A few hard lessons learned on this one, I'm afraid. First of all, if you don't have a doorbell installed in a three story old brick home, the pizza delivery guy will get a really annoyed look on his face when you saunter on down to the first floor, open the door and say, "Hey, how long have you been standing there?" It's not like we didn't plan for a door bell. We planned on a wired bell, (because all of the wireless ones just looked like cheap cr@p from a lead infested plastic plant in China) so we bought a wired bell and transformer. You need all three parts, actually, the bell, the transformer and the button to make the electric connection that tells the bell to go ding-dong with the power from the transformer. But more importantly, before the drywall went up, we ran the wiring. If you're installing a wired bell, you need to run the wire from the doorbell button to the transformer, then from the transformer to the bell. Because there are two wires in any door bell (low voltage) wire, you're actually creating an electric loop. We ran wire from the basement (location of the transformer) up to the doorbell through the inside of the brick wall before we replaced our kitchen door, chipped through a brick and knocked out enough brick to hold the recessed button and wire. Elegant solution and no exposed external wires. So far so good. Then we ran a wire from the basement (transformer) up through the ductwork in the kitchen, into the ductwork of the laundry room and over the top of the dropped ceiling into the hallway of the second floor. Of course, we installed the doorbell wire the day before the drywall was to go up, which meant we were in a bit of a scurry. (I'd normally use the word hurry here, but we were much more like insane panicked rodents than normal human beings. It seemed appropriate.) It also meant we were not in our right minds and did not test the connections of the wires. You see, we secured the wires to the joists and 2x4's with a staple gun. We think this is where we went so badly wrong. You see, it doesn't matter how carefully you lay your wires throughout the house, how deftly you poked and prodded the continuous current into nooks and crannies so as to be uber-careful ensuring that the dry wall screws have no opportunity to nick or cut the delicate wires underneath -- WHEN YOU SHORT CIRCUIT THE WIRE WITH EVERY METAL STAPLE YOU USE TO HOLD IT IN PLACE. Yeah, the wires were completely useless. All that work for nada. Both wires to and from the transformer were shot. So now, there's no way in hell we can manage the doorbell on the second floor. It would just cause more damage to the drywall than I want to try to repair at this point, and since we did test the door bell all over the house, leaving it on the first floor should still make it audible from the third. 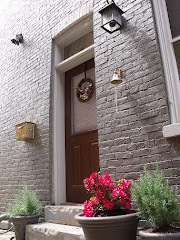 We realized the bell wasn't going to work before we installed the new kitchen door, so at that time, I tucked some wire into the brick and let it hang to the exterior of the house and just left it there. The other end was attached to the spool, and has been that way for weeks now. Since the elegant exterior brick wiring was kaput, we moved the transformer away from the breaker box to be situated under the floor joists of the kitchen in the basement so the wire going from the doorbell to the transformer was only about 10 feet. On the exterior, I had to chip away the mortar between two bricks, enough to tuck the wire in and seal it up with caulk. On the inside, we drilled a small hole into the floor behind the baseboard and into the basement to the transformer. So far, so good. Now from the transformer to the bell mechanism: where to put it? We thought the best place to put it was in the living room, as it's close to the stairwell, and that's where sound should travel the best. We figured we'd just put it on the wall on the side of the closet, run the wire up on the inside of the closet, then punch through to the outside and attach the bell mechanism about eight feet up off of the floor. Oh, and as a second thought, why put the bell on the outside of the wall? It's not like we have a solid door on the closet, maybe we'll just put the bell inside the closet and leave it there.